To realise that conflict is all around us; and that avoiding it is impossible and undesirable. To learn how to identify the clues of conflict. Question:Who in the room has ever had a conflict? Raise your own hand, to indicate that’s what you want participants to do. Who would like to have handled at least one of those conflicts in a different way? Conflict is all around us. It’s not something we can choose to have or not have. It just is. It may centre on something as seemingly trivial as who leaves their dirty teacups in the sink, where to go for Christmas lunch, or whether to buy a new piece of equipment for work; or it may be more complicated, such as how much forest will be logged, what national defence strategies we should adopt or who will get social security payments. This course is not about avoiding conflict. Avoiding is not only impossible but undesirable! This course is about discovering productive ways of handling conflict – ways that make a difference in all areas of our lives – with work colleagues, friends, spouses, children, salespeople, doctors and bosses. Question: Conflict – what does that cover? What does it mean to you? Ask participants to write down their responses and then share them with the entire group. Draw attention to the different associations to conflict participants make. Some will describe conflicts as fight, disagreement, war. Others may identify causes e.g. difference of opinion or perspective, difference in personality. Others may note the feeling it engenders e.g. tension, anxiety stress. Question: Think of a conflict which has been handled in a destructive way. What are some of the outcomes in such a case? Question: Think of a conflict which has been handled constructively. What are some of the outcomes in such a case? We’ve all had experience of conflict being handled constructively and destructively. The outcomes of conflict handled constructively are so much more attractive, it’s a wonder we ever settle for less! How do we know there’s a conflict happening? There may be some very obvious signs which we can easily recognise, or there may only be a few subtle clues. It is this range that we’re going to explore now. 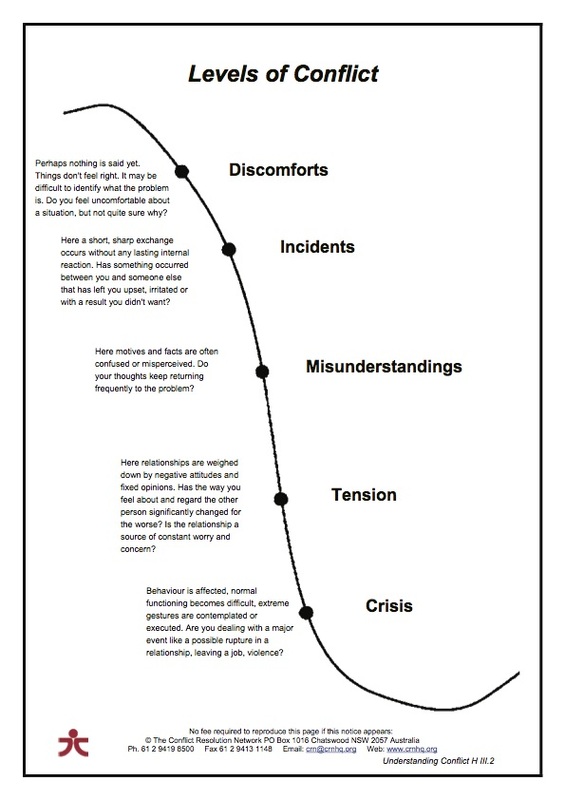 If emotions are running very high, if the conflict seems extremely complex, chances are it has reached crisis stage. 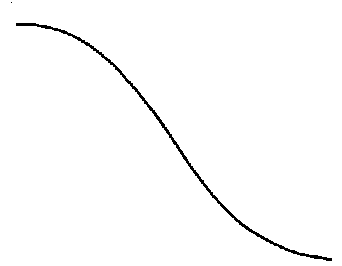 Draw a curve on the board and write the word ”crisis”. These clues are obvious – there is unresolved conflict. Often, if we’re on the look out we can see conflict brewing well before it reaches crisis. If we stay alert for conflict in its early stages, it is a lot easier to manage. For instance, think of that niggling or ”gut” feeling that things just aren’t right? We could call that discomfort. 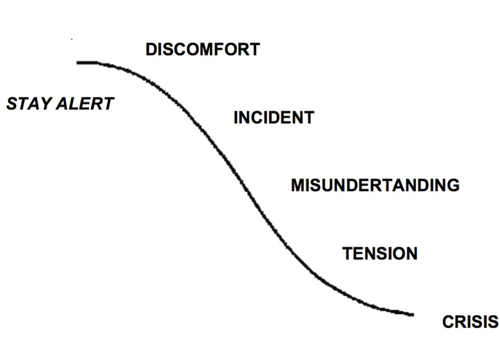 Add ”discomfort” to the curve. Has something minor happened which has left you upset or irritated? Has there been an incident which suggests that something is wrong? Are the details of a situation unclear? Has there been a misunderstanding about motives or intent? Are you feeling anxious about your relationship with the other person? Are you at the point of one more nudge and then you’ll explode/resign/ give him/her a piece of your mind? Does each subsequent experience with the person confirm your negative attitude towards him/her? Are you feeling a high level of tension in your relationship? Look for clues to conflict at discomfort or incident level. Dealing with conflict at these levels rather than at crisis, when emotions run high, gives a greater chance of a constructive rather than a destructive outcome. Our response to the discomfort may be to ”stay alert” and choose an appropriate time, opportunity or option to tackle the issue. Give out the handout: “Levels of Conflict Exercise”. Question:Think of a current or recent conflict. Can you identify what level it has reached? Discussion:Ask participants to write their responses on the handout and complete the appropriate questions. Allow 2 minutes. Question:Can you trace the development of the conflict, by identifying clues at earlier levels? Ask participants to talk with a partner about anything significant in that process. Allow 2 minutes each way. Look for the early clues to conflict. Stay alert, ready to act, if and when appropriate. Greet conflict in a positive way, ready to learn something new or improve the relationship. Identify the level of conflict as this may help us choose an appropriate strategy. Give out the handout: “Levels of Conflict”. In this course, we will cover a range of skills for dealing with conflict. These skills are like tools; we pull one or more out of the kit to suit a particular conflict. The rest sit in the kit ready to be used in another context. Just as a tool can be used in many situations, so too can these skills. We can use the same skill dealing with our young children, as we might with a colleague at work. Give an overview of the skills that will be covered in the course. If the session is finishing at this point it may be valuable to conclude with a positive idea about greeting conflict. Choose a recent conflict involving you. It could be anything from a minor discomfort to a huge crisis. Are you mulling over the situation because it is not sitting quite right with you? What are your feelings/thoughts about it? So far, have you said quite little about it? Can you point to one or several specific occasions in which you clashed on this subject? What was said that was upsetting? Do you believe the other person has misinterpreted your feelings, motives or responsibilities? How? Could you be misinterpreting the other person’s? How? Do you now hold a negative stance towards this person? Does each new interaction confirm your poor opinion of him/her? In what ways? Has a major explosion occurred? Were extreme measures threatened? What? Were extreme measures executed? What? Was the outcome constructive or destructive? In what ways? Understanding Conflict by Conflict Resolution Network is licensed under a Creative Commons Attribution-NonCommercial 4.0 International License, except where otherwise noted.